E-Sewa is Free and Best Way to Send Money or Pay Bill in Nepal. 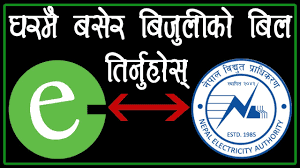 Esewa is First Online Payment Get way For Nepali. In This Article, I am Going To Tell You How You Can Pay Electricity bill by E-sewa. First You Need To Create E-Sewa Account. Now Login Your Account In Website Or Android App. Now Click OK Then Done You Payment Compiled You can Get mail with in 2 hr.